Of course there are many different ways to get all this working, but after trying for days I decided to do it as follows. As for we are only talking about Sync, I don't speak about the audio-connections. The sync-connections may be looked up in the diagram. It is a Shockwave Flash drawing so you can do some nice things with the mouse. The upper is the back of the dtp and the lowest the mtp. The TC M3000 just gets wordclock and midi but that has nothing to do with the syncing of the system. "Steckfeld" means patchbay where midi-signals from somewhere else can be patched. The dtp is transport, wordclock and adress-master. The d8b acts as the main transport-controller (play, stop, ff, rew, ...). The mtp is just used as a midi interface for the mac and as patchbay for other midi-signals, although it is capable of doing all the here necessary syncing itself. We added the dtp to the setup because it generates wordclock and digidesign's superclock at the same time (the mtp does just one of them) and it is more flexible for later extensions (video, 9-pin, etc.). Just set the desired rate at the dtp's frontpanel - the d8b and PT do recognize any changes immediately. Although both of them do NOT change their displays, they are in correct rate, as for they are slaves. For being sure I always change the samplerate-setting in the d8b (setup/digital IO) and in PT (session setup window) anyway. PT has to be in internal sync-mode, what sounds really strange, but that's the only mode it realizes that it is slaved - all other modes (digital, optical) are "master-modes". The adat is always right with any syncing-questions because as soon as there is the adatsync-signal connected those things can't be changed locally. As for we are here in Europe we use 25 fps. This has to be equally selected in each device - except for the adat that is controlled by the dtp and the mtp that we use only for the transport of midi-signals. 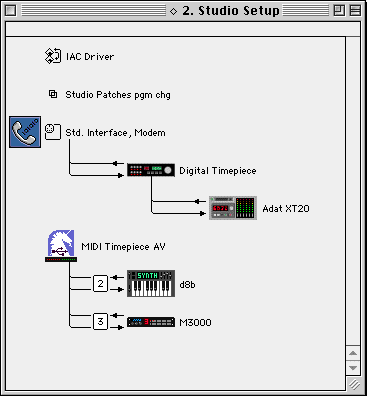 All our devices communicate via MTC (midi timecode) except for the DA60 who gets smpte. The Mac has got a "Griffin" serial port instead of the modem. That's where the dtp is connected to. Via USB the mtp acts as a "simple" midi-interface. The mac's OMS-configuration is described in a seperate chapter later on. Using the button at the dtp's front it is set to "internal" - meaning it is the big boss. It does so until it is told to stop or to locate somewhere else. Again I want to emphasize that the mtp just patches midi-signals from specific ins to outs. All its syncing parts should be turned off by not connecting the so called cables (internal!) to the MTC or MMC in- / out-ports. The following is also referred to as MMC-control. Since we have devices of many different manufacturers here and all they want is earning money with their own products there are some problems. We want to use the d8b to locate and control play/stop. First of all I have to say that neither record nor track arming works! These things have to be controlled locally in PT or at the adat's frontpanel. Why? I guess digidesign wants users to buy ProControl and not to use some "cheap" desk, although Mackie's HUI is allowed to. In fact that function seems to be disabled. No idea. With the adat it is really difficult. I've been in contact to MoTu about that and after two weeks of discussing they confessed the dtp to be unable to translate the MMC-commands from the d8b to the adatsync-out. The funny thing is that you might use their "Clockworks" - software to do all the trackarming, recording and even some more functions remotely controlled from the mac. The dtp sends everything correctly to the adat. The MMC-midi-signals from the d8b are also indicated to be received but they are not converted! And the most funny thing is: the mtp IS ABLE to do that. I proofed it. So when you just take the d8b, an adat and the mtp all the trackarming and recording works remotely controlled from the d8b as it should be. So perhaps someday the MoTu-guys change that. What do we have now? We control play, stop. Well, the FF / REW buttons do in- /decrease the actual timecode-position by ten seconds. Sounds strange but this again is a "feature" of the dtp. I can live with that as for bigger "jumps" you use the "set time" or "locate"-functions of the d8b. I even got used to these 10 sec jumps. The biggest problem here is that the d8b does not display these 10 sec jumps because they alter the timecode-position directly in the dtp and that position is only transmitted back the next time play is engaged. As I mentioned you better use "set time" - where you enter a timecode-position directly in the d8b and this new position is then transmitted to the dtp. So the d8b displays the correct value. Of course it is the same with the locators. Once recalled in the d8b the new position is displayed in the d8b's timecode display and transmitted to the dtp to set it to that new timecode position. And one nice thing to use is the "Loop" function - but any d8b user will know that. One thing I haven't found a sense for is the d8b's jog dial. I does nothing. In the mode where the red Jog/Shuttle LED is lit it sends out lots of midi-data - but none of the devices here react. A nice thing I have to add is the control of adats via the dtp. It knows what the connected adat is doing. So when you press play at the d8b and there is an adat-tape in the machine the dtp tells the adat to locate to somewhere near the actual timecode position. Only when the adat reaches that position the dtp starts generating timecode. That's especially nice when looping. When there is no adat in the machine or it is turned off generating starts immediately. PT is still able to run independently what is really useful to just quickly record or playback something and almost necessary for editing. As long as the remote trackarming does not work you don't have to worry about the MMC-device-ids, although it is a good idea to give each device a unique one. Discussing the MMC-ids is quite diffcult because the dtp is using so called "soft" ids. Besides, disable these two OMS settings: "run midi in background" and "use apple serialDMA driver when available". In PT enable all the midi inputs (midi / devices) you need. In Setups / Peripherals / Synchronisation select device: "Generic MTC Reader", Port: "digital Timepiece". Now you should see any running timecode in the Session Setup Window. As soon as you put PT online it should chase to the incoming timecode. As I said above: PT might still be run without running timecode from the dtp and of course even in that case the whole system is wordclocked from the dtp.